A YEAR OF JUBILEE REVIEWS: Red Apple Lipstick is voted best Gluten Free Cosmetic! 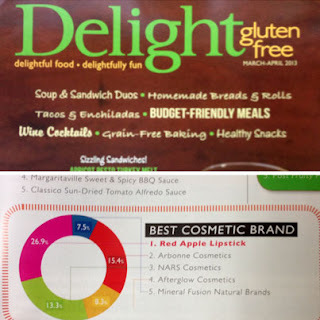 Red Apple Lipstick is voted best Gluten Free Cosmetic! No suprise to me and many of my readers as Red Apple Lipstick company offers a beautiful line of cosmetics. Beating out Arbonne, NARS, Afterglow and other Cosmetic companies, be sure to look into Red Apple for the Best voted GF cosmetics! Safe lipsticks, no more weird smell and chemicals! Super moisturizing and beautiful colors. I just got a review sample in the mail yesterday and I am so excited to try it and share it with you all! Be watching for my review to come, but while you wait, be sure to check out Red Apple Lipstick online! Wow! I'll definitely check this out! This seems like a product worth buying, I do like that it is NEVER tested on animals, that is important.